Numerous tree species’ seeds contain an ‘elaiosome’ that acts as a food reward for ants and thus induces dispersal of the seeds. Many stick and leaf insect species appear to have evolved a convergent adaptation for dispersal whereby the egg ‘capitulum’ serves to induce ants to pick up and carry their eggs. Here, we investigated whether the capitulum facilitates egg dispersal by ants in the Australian stick insect Eurycnema goliath. The total fatty acid composition of E. goliath egg capsules and egg capitula were characterized to identify potential signaling compounds. Removing capitula from E. goliath eggs significantly reduced the likelihood of eggs being carried into the nests of Rhytidoponera metallica ants. Furthermore, attaching capitula to inert objects (polystyrene balls) resulted in these objects being carried into nests by R. metallica. Several fatty acids were present on the egg capsule surface in only trace amounts, whereas they made up over 10 % of the dry weight of egg capitula. The fatty acid composition of egg capitula consisted mostly of palmitic acid (C16:0), linoleic acid (C18: 2n6c), oleic acid (C18:1n9c), linolenic acid (C18:3n3), and stearic acid (C18:0). Previously reported research has found that a diglyceride lipid species of oleic acid induces carrying behavior in R. metallica when added to inert artificial stimuli. 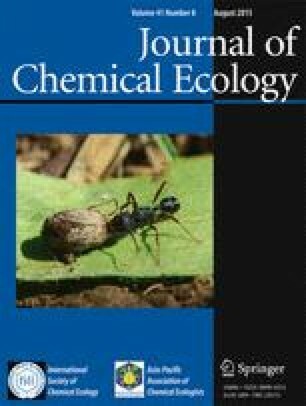 Therefore, we propose that the dispersal mechanism of E. goliath eggs has converged upon the same chemical signaling pathway used by plants to exploit ant behavior. We are indebted to Lucy-Marie Kempson, Lucy O’Farrell, Amy Smart, Erin Lynch, and Daniel Kitanov for assistance with data collection and animal husbandry. Macquarie University, the Linnean Society of New South Wales, and the Orthopterists’ Society provided funding to JC O’Hanlon. The authors are grateful to the Victorian Node of Metabolomics Australia, which is funded through Bioplatforms Australia Pty. Ltd., a National Collaborative Research Infrastructure Strategy (NCRIS), 5.1 Biomolecular platforms and informatics investment, and co-investment from the Victorian State Government and The University of Melbourne.